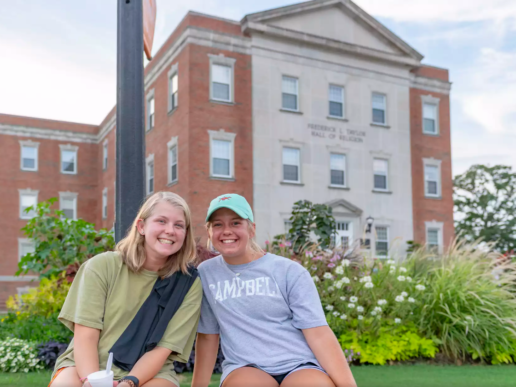 More than 1,160 donors gave a total of $225,195 to fund a new student union, student scholarships, various athletics programs and other endeavors on Campbell University’s second annual #CampbellGivingDay event on Wednesday. 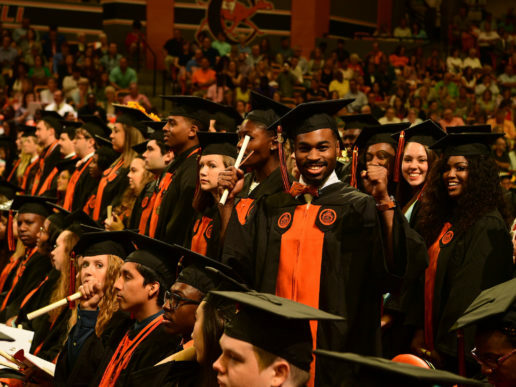 For the second consecutive year, Campbell students, alumni and faculty and staff topped the University’s donor goal — this year, that goal was set at 1,000 gifts. Giving Day is part of the annual Founders Week celebration, which began Monday and runs through Saturday this week. 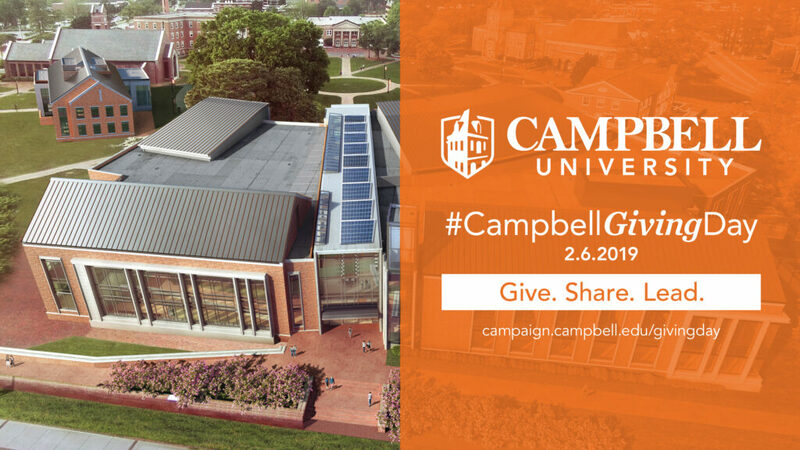 “#CampbellGivingDay is an example of the good that can come when the Campbell community comes together,” said Tammi Fries, director of Annual Giving. “On Wednesday, our community gave to support Campbell’s mission, shared on social media why it is important to give and we led others to join in the support. This one day is special not only because of what we do on this day, but the fact that these gifts will impact Campbell and our students now and for years to come.” Other various challenges were met throughout the day as well. The Young Alumni Challenge netted donations from more than 250 recent graduates, current seniors and other underclassmen. 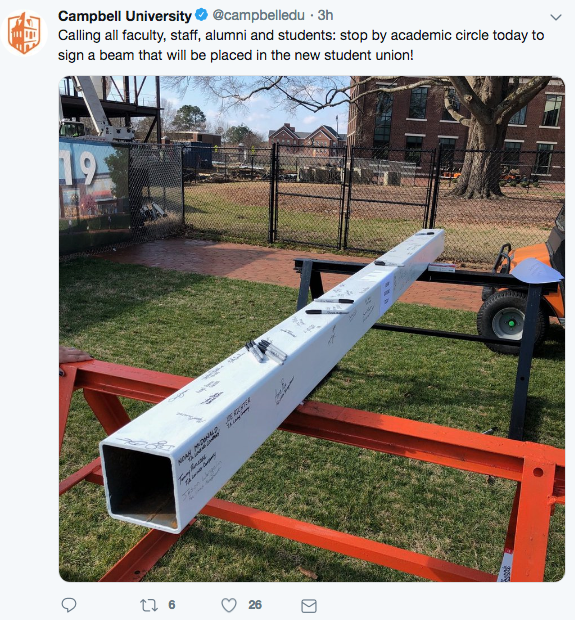 The Hashtag Challenge goal was blown out of the water, according to Fries, as her staff continues to count the #CampbellGivingDay mentions across several social media platforms. While donors could choose where their gifts would be used on Wednesday, many donors chose the student union and student scholarships — the cornerstones of President J. Bradley Creed’s current $75 million Campbell Leads fundraising campaign. The 110,000-square-foot student union — currently under construction in Campbell’s Academic Circle — is expected to be completed this fall and will bring new dining options, a two-story fitness facility, a new gift shop, Harnett County’s only movie theater, a large ballroom and several offices and study areas for students and student-run groups. Campbell Founders Week continues at 3 p.m. today with the annual Highland Games, hosted by the Campus Activities Board. The Scottish-themed games pay honor to Campbell University Founder J.A. Campbell’s Scottish heritage. On Friday, the Office of Alumni Engagement will host an open house and dedication ceremony for the Cornelia Campbell Alumni House on Leslie Campbell Avenue. 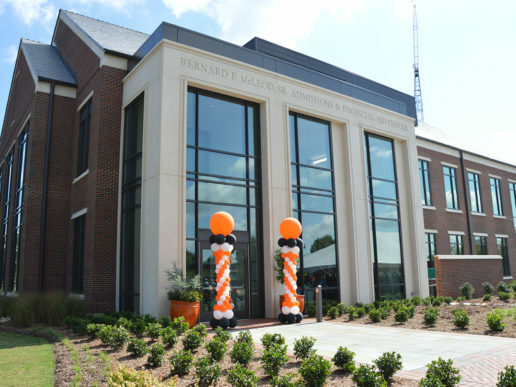 The building, which formerly housed Campbell Admissions, has been renovated this year to accompany the full Alumni Engagement staff, Annual Giving and the student call team. It is the former home of its namesake, Cornelia Patterson Campbell, wife of Campbell University’s founding president. On hand for the ceremony will be 1946 graduate Dorothea Stewart-Gilbert, who attended Campbell during World War II and whose family has been associated with Campbell since its Buies Creek Academy days. Stewart-Gilbert talked about her memories of Cornelia Campbell on Campbell University’s podcast, Rhymes With Orange, this week (podcast embedded below). On Saturday, Founders Week will close with two throwback basketball games — the Campbell women’s team against UNC Asheville at 2 p.m. at Gore Arena and the men’s team against USC Upstate at 4 p.m. Originally, bobbleheads featuring Campbell’s new female mascot Gladys were to be handed out for the game, but a manufacturer’s delay has forced the bobblehead handout to be pushed back to an yet-to-be-determined date.